Ulyatt examines the ideas that shaped Theodore Sorensen’s concept of public service and how they influenced his life and work. 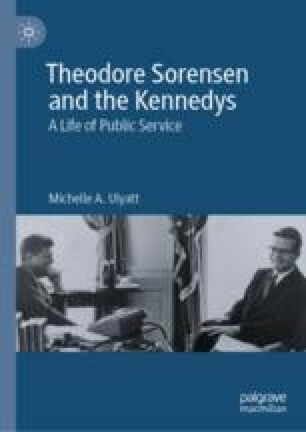 The chapter explores the origins and early development of Sorensen’s views about the role of public servants, which informed his later work with John F. Kennedy. It charts Sorensen’s early life in Nebraska, where his experiences rooted him in the liberal progressive tradition. The chapter also explores the influence that Christian and Annis Sorensen, and Nebraska Senator George W. Norris, exerted over Theodore’s understanding of politics, including the commitment to justice and equality that was central to his ideas about public service. Lincoln Journal Star. 1923. “Nebraska Women at National Meeting.” April 11. https://www.newspapers.com/newspage/36998765. ———. January 26, 1949. https://www.newspapers.com/newspage/62809172. Nebraska State Historical Society. 2016. “Peace Ship.” May 2016. https://history.nebraska.gov/publications/peace-ship. ———. 2017. “C. A. Sorensen and the Downfall of Omaha Crime Boss Tom Dennison.” November 7. https://history.nebraska.gov/blog/c-sorensen-and-downfall-omaha-crime-boss-tom-dennison. Norris, George W. 1917. “George W. Norris Speech to Congress.” April 4. https://wwi.lib.byu.edu/index.php/Senator_Norris_Opposes_U.S._Entry_into_the_War. Sorensen, Christian A. 1931. “Report of the Attorney General of the State of Nebraska for the Biennium Ending December 15, 1930.” January 1. http://nebpubdocs.unl.edu/searchdoc.php?fulltext=report%20of%20the%20attorney%20general%20of%20the%20state%20of%20nebraska%20for%20the%20biennium%20ending%20december%2015,%201930&doc_id=npd.00068.00009&sort=page_id&pageLength=300.